We've been shortlisted for this. Yoinks. 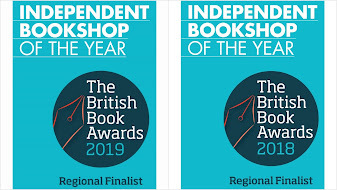 This means (apparently) that we will be mystery-shopped twice in the next fortnight as part of the judging process. 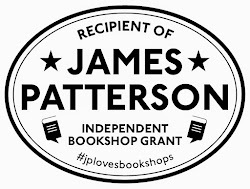 I will try to remain calm and not act like a grinning, over-friendly idiot every time someone new enters the shop over the next two weeks... Congratulations to our other shortlistees: Bookstór in Cork, Mr B's Emporium of Reading Delights in Bath and Seven Stories Bookshop in Newcastle-upon-Tyne. Joy indeed. Many, many congratulations, Mark and Nicki. You really deserve this, and I am earnestly trying to 'witch' that you win. Surely you deserve a write-up in the local rag for such an accolade. Brilliant - congratulations! You've made such a difference in Abingdon, you deserve to win. It's so so well deserved. Can we do anything to help you on your way to winning? Can we vote for you anywhere?